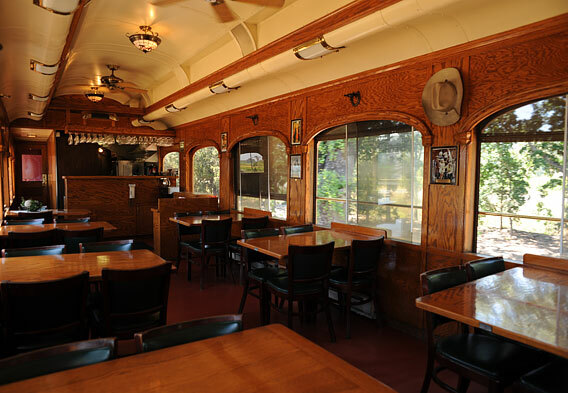 The current Napa Valley Wine Train was established in 1987 by Vincent DeDomenico, former President of the San Francisco Golden Grain Company made famous by its product Rice-A-Roni. In 1920, a Calistoga store owner tapped into a mineral hot springs while trying to sink a cold-water well. This became the famous Calistoga Mineral Water Company, and the town is today known as a mineral hot springs wellness center. Originally, the Napa Valley Railroad stretched from Calistoga to Vallejo, where it connected with the San Francisco ferry service. It is still possible to reach the Napa Valley area by ferry and train from San Francisco. 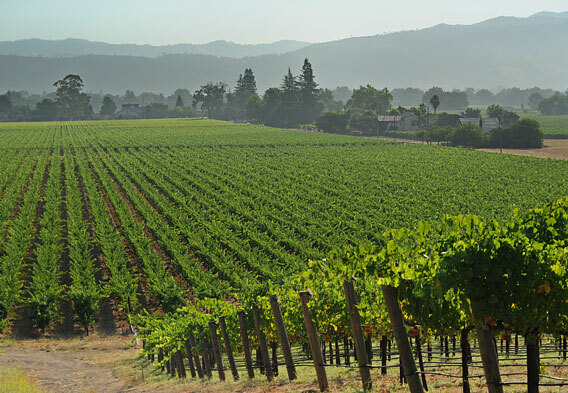 Napa Valley vineyards are some of the most famous in the world, producing many internationally respected vintages. Many of the towns in the area retain their historic character and they are known for gourmet restaurants and charming cafes, luxurious spas, exclusive hotels, and charming bed and breakfast inns. Napa Valley vineyards and wineries comprise one of California’s most popular tourist sites, welcoming more than 5 million visitors per year. There are about 400 wineries and Napa Valley vineyards, as well as a large number of brands. Many of the wineries are world famous, and date to the earliest days of viticulture in the valley. The Rubicon Estate Winery is an example of the kind of history associated with many area wineries. It was originally called Inglenook, and founded in 1879 by a Finnish sea captain named Gustave Niebaum. In 1975, the Oscar winning film director Francis Ford Coppola purchased Niebaum’s Victorian home and more than 1,500 acres of vineyards. At the time, Coppola was merely looking for a summer home where he could produce wine in his basement the way his grandfather did in Italy. Twenty years later, Coppola purchased the grand Inglenook chateau and more vineyards including the famous Heitz Wine Cellars, Martha’s Vineyards, and Beaulieu Vineyards (one of the oldest in the valley). In 2006, the name of the winery was changed to Rubicon. Other important wineries include Chateau Montelena, Schramsberg, Beringer Vineyards, Charles Krug, and Mondavi. This unique traveling dining experience runs along 25 miles of track between the towns of Napa and St. Helena in the heart of the Napa Valley vineyards. The Napa Valley Wine Train is a beautifully refurbished antique train with two engines, three kitchens, and a collection of rolling stock from the early 1900s. The stretch of track along which it runs is part of the original Napa Valley Railroad lines established by the settler Samuel Brannan in 1864. His original purpose was to bring tourists to the resort town of Calistoga, which he founded. Duration of both lunch and dinner excursions is three hours, and a number of packages and specials are available. There are romantic meals in the Vista Dome car, traditional barbecue meals in the Silverado car, and white linen table service in other cars. After dinner, passengers can retire to the mahogany and velvet lounge car. There are also murder mystery and other themed journeys—all with appropriate wines from the Napa Valley vineyards. Capacity is 370 passengers Two runs are made on weekdays, three on weekends. 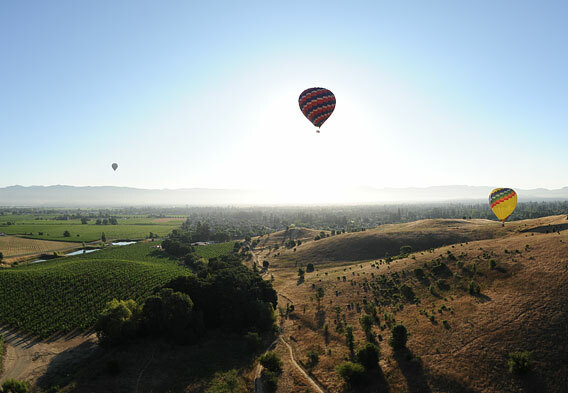 The Napa Valley is one of the original areas popular for hot air balloon tourism that has since spread to other tourist destinations such as Palm Springs, Arizona, Kenya, and Tanzania. The valley scenery, landscapes, and wind patterns are particularly suitable for this kind of tourism. There are a number of balloon operators in the area, and there are colorful balloons in the air virtually all year long. There are also several hot air balloon festivals in the area.